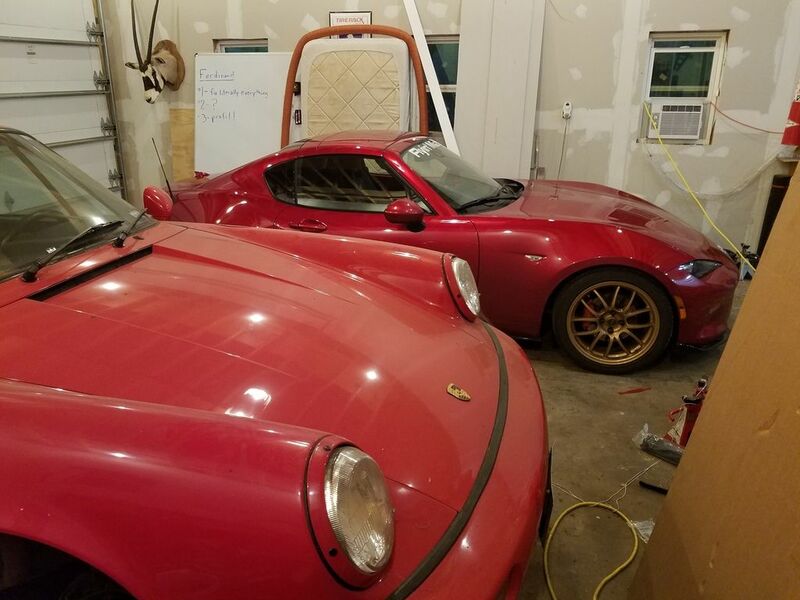 As Keith said "The secret to Miatas is that they make it easy to be better than we are"
Hey..I drove one year round for 10 years...Why do you think I choose to make a Miata the foundation for the Molvo? 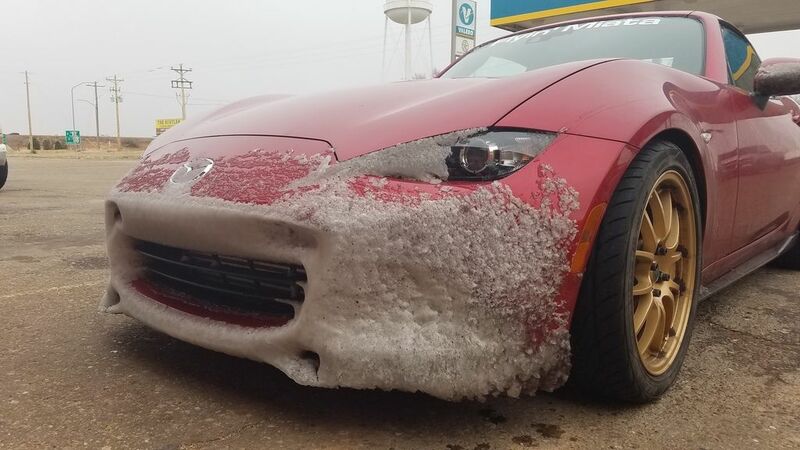 I have arrived home from a 80 mile drive from work with the front of the Miata looking like that picture. 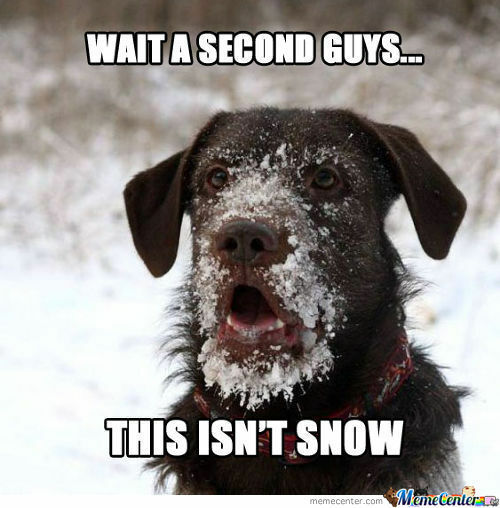 But I had snow tires. Fingers crossed some of the magic remains in the resulting Chimera. It was 26 degrees and things were good here. We went up. It got down to 12 degrees with about 8 inches of snow. I did not stop to take pictures. Life is interesting when the car starts wiggling at 13mph so you slow down to 11. I have to admit I had some tightness in my stomach reading through these updates. My experience with summer tires in snow is *all* bad. I am shocked and amazed that you made it through okay. 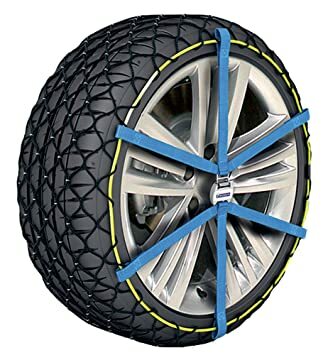 Given that we're entering snow season, do any of you guys have experience with snow chains or products like the 'easy grip' from Michelin? 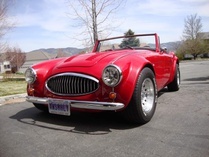 I run summer tires only and I'm thinking about keeping something in the back of my Jag in case I get caught in bad weather. Colorado DOT calls out "Autosocks" as a legit alternative to chains. I keep a set in the BMW. I got caught in a winter storm in that thing a couple of years ago - the big passes on I-70 in Utah where 18 wheelers were getting stuck because they couldn't maintain speed at 10 mph. I'm pretty sure they closed one of the passes behind us because there was NO other traffic after a while, just a 400 hp BMW with 275-section summer tires trying to maintain forward motion. After that, I bought the Autosocks. I have a set of Autosocks for my FoRS. If we get any nasty stuff this winter, I'll give them a try. I'm watching this thread like a proud papa :) We all miss Rufus here and it's great seeing how he's welcomed in his new home. Bah humbug. Snow is just something you respect abd drive sensibly in. I picked up my 996 in Aurora near Denver in April. We got caught in a freak snow storm that closed Raton Pass. A 996 on Michelin Super Sports does amazingly well on bad roads. It did way better than any of my domestic v8 RWD cars ever did. I’m also very Texan but lived all over in the Navy. 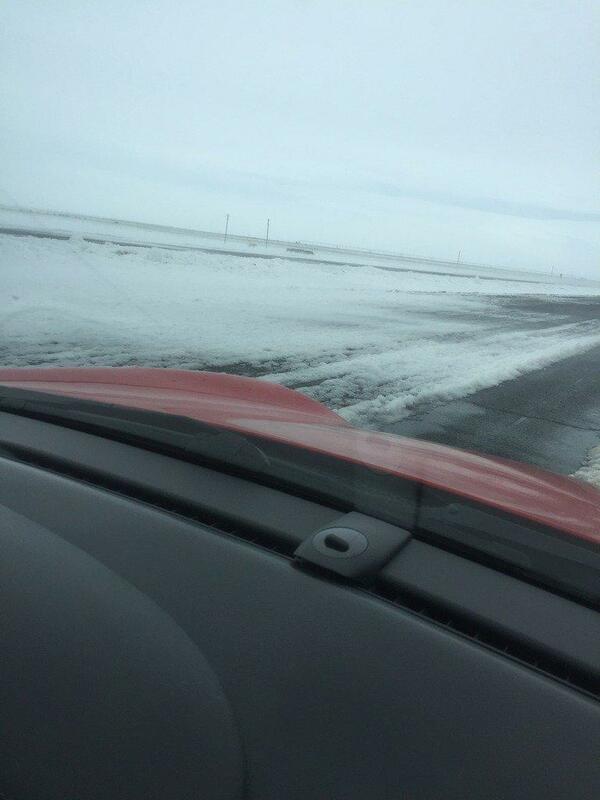 I learned to drive low traction conditions by doing stupid stuff on dirt roads in V8 rwd trucks when a lot younger. Seth’s weather speed driving chart is spot on. 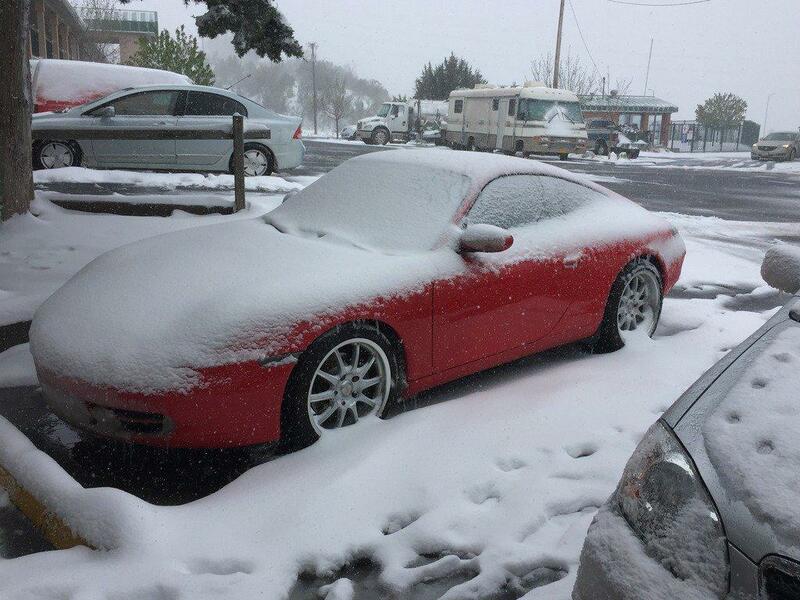 The real moral of this story is don’t buy Colorado cars unless it’s May to September! Looks just like a 1 year old would look after eating an ice cream cone. It looks like you blew a seal. Who knows the rest of the joke? Just fix the car and leave my personal life out of it! no, it’s just ice cream. Rufus was left home today so I could get it inspected and and washed. The plan was also to get registration done but the tax office doesn't like how Colorado does things and wants us to fill them out the Texas way so there is a bit of mailing that's happening. In the mean time, more driving. 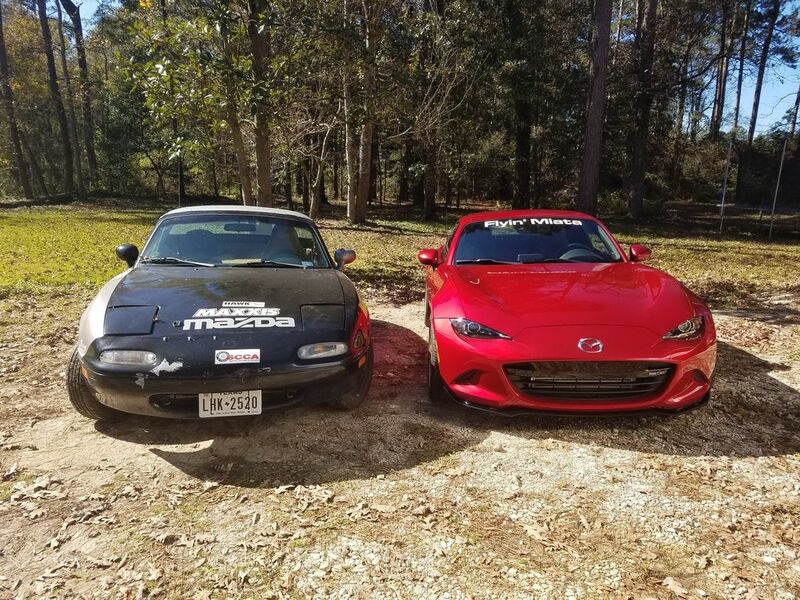 The day that we mailed the check for Rufus to Flyin' Miata my wife sent me this picture with the damand that I recreate it when the cars were in the same place. Done and done. dude, what a gnarly pair of answers! "I'm pretty sure you've gotta them swapped right for left"
One of the neatest design features from the drivers seat are the body color upper door inners. They have the same sculpted patterns as the outside of the car and your eyes connect body lines from the crease in the hood to the door/dash interface. This makes the A pillar disappear in a way that it doesn't in the NA Miata. I suspect this has been written about elsewhere but as someone who didn't remember reading it I was delighted by it once on the road. Is that the new King Ranch? What are those, $86,000? 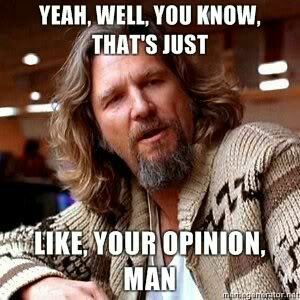 Are you saying you have not seen The Big Lebowski? If so, this aggression will not stand. The body color door panel didn't make sense until now. Kinda neat, and im sure more awesome in person. There's a little piece of piano black trim in the center of the dash that I want to repaint in body color in the worst way. 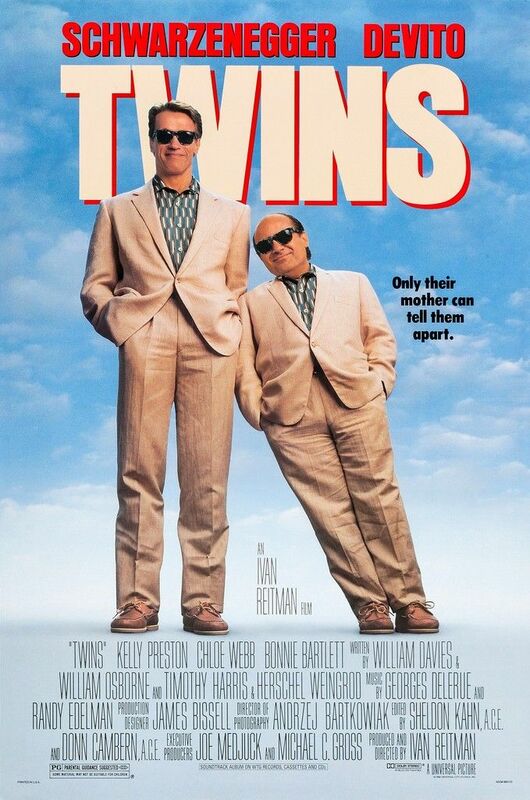 We ever meet up in Dallas, I will take you to meet the dude: no joke. I need to come up there for something social that isn't a track day or a smash and grab run to pick up or drop off kid#1. We'll have to arrange something. Fun fact about Rufus, it has a FM inventory number, and since it's no longer in inventory a sale/shipment was generated and I got notice that my order of 1.00 2017 Mazda MX5 "Rufus" had shipped. Successful delivery. Good job choosing the shipper FM. It's always hard for me to evaluate a car on foreign roads. Is the suspension choppy or are the roads choppy? Tires noisy or just chip seal? How fast is fast in this corner? It's only when I have a car home and I can put some miles in on my regular routes that I start to understand how good or bad a car is. Terrible picture of the car tucked in the garage after the school run this morning because there aren't enough pictures of the car in this thread. Mrs. Deuce is lucky the seat isn't two inches lower. My only complaint is the same one that I have with other Miatas, that I'm just too high in the car to be as comfortable as I want. In the ND I'm actually ok with the roof and the windshield frame and the A pillar and a bunch of stuff that bothers me in the NA, but the rear view mirror blocks so much of the visibility out of the right side of the windshield that I feel like I have an eye patch on while driving around town. I can work around it by dipping my head to check, but it's essentially a forward facing blind spot. 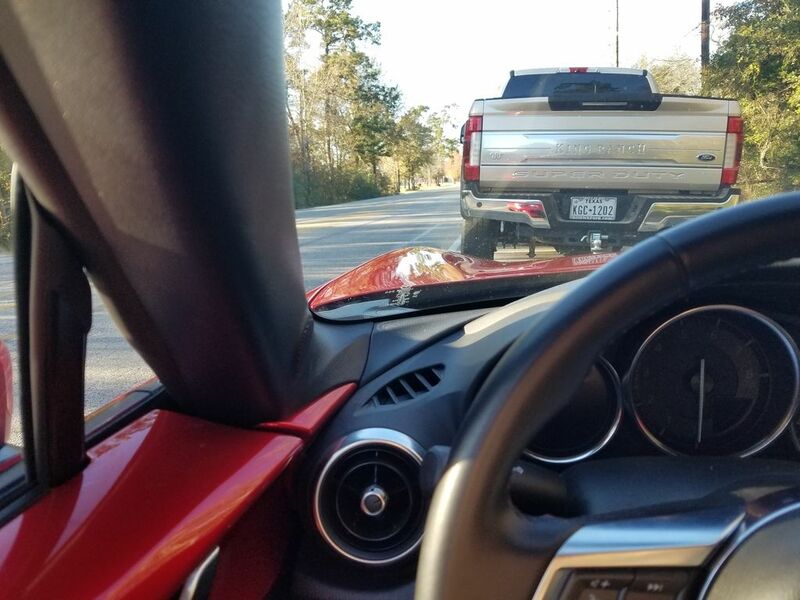 If I could rip off the stock rear view mirror and replace it with one about that hung down about half as far, that would fix the problem as well. Other than that, what a spectacular car. The steering is just the right quickness that you never adjust your hands while somehow being stable enough that it's not at all tiring to drive for excessive distances in a straight line. You feel everything the pavement tells you without it being shouted and tiring. The seats are underwhelmingly great. At first sit they seem like I'll eventually get tired of them, but I somehow never do. I don't need to wiggle to adjust things, I just sit and feel good. With cruise on there is enough room between the brake and clutch to stretch a leg out on long highway stretches. That seat height is the only problem. I'm so jealous of my wife. The car fits her like a glove.